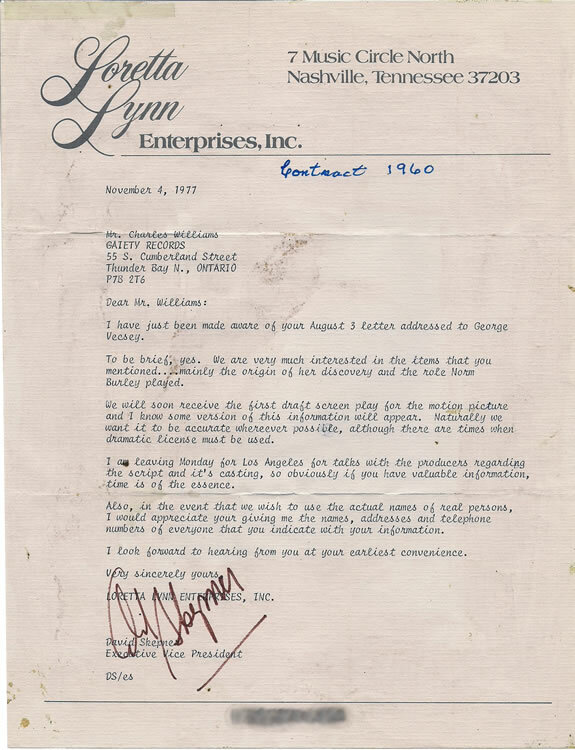 In 1977, When Grashey and Williams heard that Coal Miner's Daughter was being made into a film, they provided Loretta's manager David Skepner with the correct info regarding her Zero Record days. They sent him background material to forward to the filmmakers. None of it made it into the script. Director Michael Apted's film, which earned Sissy Spacek an Oscar for her depiction of Loretta, makes no attempt whatsoever to explain how a gal goes from singing in Whatcom County's Delta Grange Hall to recording a hit single. The screenplay has Loretta debuting with the Lynden, Washington band, the Westerneers, and then cuts to her in the car with Doo (played by Tommy Lee Jones) and her kids. Her husband tells her she has to make the best darned record she can. In the next scene, they are in a dark, cramped, nameless studio. The movie does not mention Zero Records, Norm Burley, Don Grashey, Speedy West, Western Recorders, Vancouver, nor the Chicken Coop where the Canadian record executives first spotted the future Queen of Country.